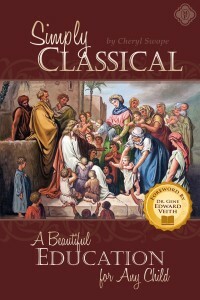 One of the best books I have ever read on classical education is the just-released Simply Classical: A Beautiful Education for Any Child from Memoria Press. Cheryl Swope’s book not only gives an unusually lucid explanation of what classical education is and how to teach it, whether in a school or at home—it reminds us of classical education’s most important quality: how human it is and how it connects with the humanness of its students, including those whose humanness is often overlooked. Cheryl tells about how she applied classical education in homeschooling her twins, special-needs children afflicted with autism and a number of other heart-breaking mental problems. Whereas progressive education, with its reductionistic view of human beings, would have just tried to program the twins with some basic survival skills and stop there, the humane, personal, inspiring approach of classical Christian education caused them to blossom. To bloom. Not only was her daughter Michelle achieving academic levels that her doctors thought were impossible for her, she was awakening to the realm of the true, the good, and the beautiful. You have got to read Cheryl’s account of her courageous son and of her daughter, who emerges, despite her continuing difficulties, as a complex, accomplished, and compelling young woman. Michelle, now 19, has published a book of her poetry. It will blow you away. By any standards, the poems are extraordinarily meaningful and touching, filled with vivid imagery and lovely language. To know Michelle’s background, though, is to appreciate her all the more and also to appreciate the potential of classical learning for shaping a young mind and a young heart. Dr. Gene Edward Veith: Provost of Patrick Henry College, Professor of Literature, and author of over 19 books on topics such as classical education, Christianity, and culture. Originally published in The Classical Teacher Winter 2014 edition. Dr. Gene Edward Veith, Provost and Professor of Literature, oversees both Academic Affairs and Student Affairs at Patrick Henry College. He also teaches literature and other liberal arts courses. He is well-known in Christian, conservative, and homeschooling circles through his writing and speaking on various aspects of Christianity and culture. Dr. Veith is the author of 20 books on topics involving Christianity and culture, classical education, literature, and the arts. His writings number more than 100 scholarly articles, reviews, and papers and include books on Christian vocation: God at Work: Your Christian Vocation in All of Life; Christianity and Literature: The Soul of the Lion, The Witch, & The Wardrobe and Reading Between the Lines: a Christian Guide to Literature; Christianity and the Arts; State of the Arts: From Bezalel to Mapplethorpe;Painters of Faith: The Spiritual Landscape in 19th Century America; Christianity and Culture: Loving God with All Your Mind; and Postmodern Times: A Christian Guide to Contemporary Thought and Culture.